MyTaq™ Red DNA Polymerase is recommended for all standard PCR applications. 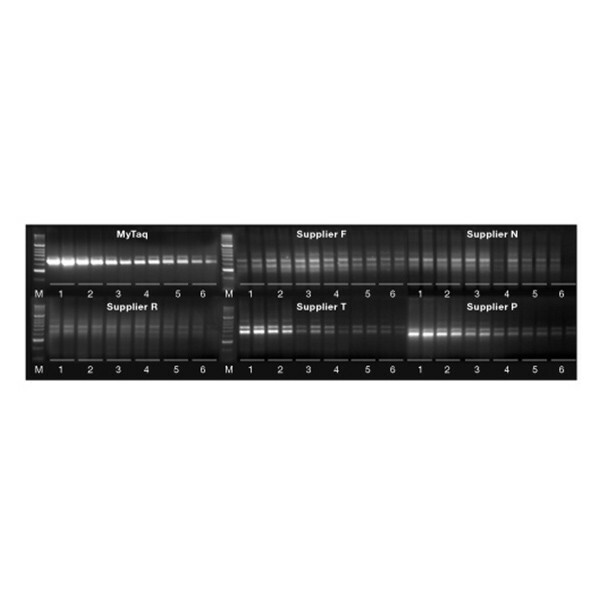 The MyTaq DNA Polymerase and MyTaq Red Reaction Buffer in this product, are a unique combination of next-generation polymerase and novel buffer system that deliver very high yield PCR amplification over a wide range of PCR templates. MyTaq has an increased affinity for DNA, enabling reliable amplification from even very low amounts of template. MyTaq DNA Polymerase has been developed to give more robust amplification than other commonly-used polymerases allowing it to perform well with challenging templates and in the presence of PCR inhibitors. Furthermore, the highly efficient nature of MyTaq means it gives excellent results under fast PCR conditions. The enzyme is supplied with a 5x MyTaq Red Reaction Buffer that increases the visual contrast between the reagent and the reaction vessel for improved convenience and to improve pipetting accuracy. The red dye also enables samples to be loaded directly on to a gel after the PCR without the need to add loading buffer. In addition, the MyTaq Red Reaction Buffer contains dNTPs, MgCl2 and enhancers at optimal concentrations, which helps eliminate the need for optimization, thereby saving time, effort and the cost of performing unnecessary assay repeats.